Have you heard of Core Content before? You have likely heard of cornerstone or pillar content for your blog. These terms mean the same thing – Core Content. Many blogs fail to get past that initial slump because they do not have any Core Content on their site. 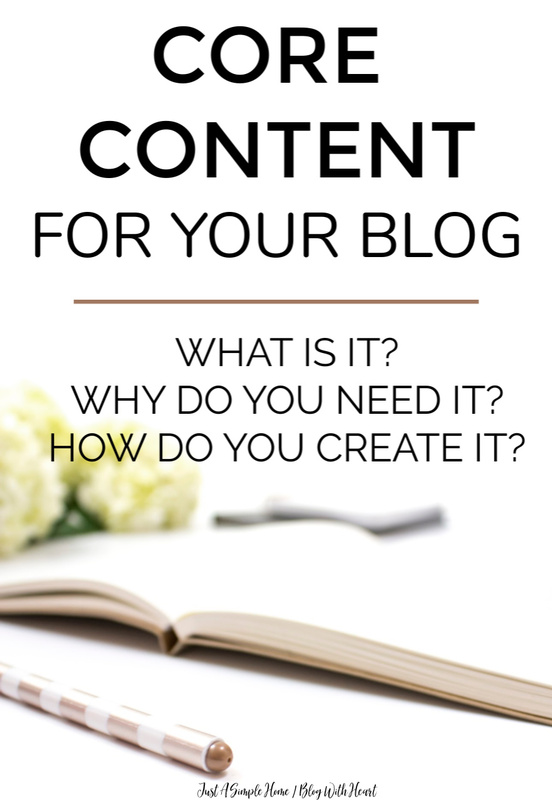 I’m going to explain what exactly Core Content is and why you need it on you blog, and then give you some tips and guidelines on creating it for your blog. Core Content is content that is difficult or even impossible for others to replicate. It is content that is unique to your site, perhaps due to the time invested in creating it, or that is includes something impractical to replicate, such as an exclusive interview. This is content you want to be known for. It is content that you will often link back to in future posts. Core Content should generate a large portion of your traffic and customer leads. Why do you need Core Content? Core Content helps you stand out from the crowd. It helps you become known for something among the mass of other bloggers. It is something that you and only you could create, so people will naturally come to you for that advice. Core Content is completely geared towards your reader, and often solves a problem that your reader has. As you can imagine, this type of content is great for attracting new readers and for gaining links to your site. For example, many bloggers have a “How To Start A Blog” post. This type of content is very generic and can get lost over on Pinterest. You are not going to have another blogger voluntarily link to your “How To Start A Blog” post. However, many bloggers will link to the “Ultimate List Of Pinterest Group Boards”, because that content takes hours and hours to create, and not many are willing to do that kind of research. Core Content gives you a competitive edge, because it is unique to your site and hard to find. Even bloggers in your exact niche will link to your post, because they won’t bother to replicate your unique content. Core Content engages new readers and keeps them coming back to your site for more. What kind of posts qualify as Core Content? We already talked about the fact that your Core Content is going to be content that is unique to you and difficult to copy. Core Content should be written for your specific reader, and should meet your reader where they are at, right now. Create content that meets a specific need or solves a problem for your reader. Explain something that you know they have questions about and give them actionable steps to accomplish a goal. Creating Core Content will, and should, take a considerable amount of time and effort. That is the point! This is content that others will not want to take the time to research and copy. It is incredibly worth it to take the time to become the expert in your particular niche. How much of my content needs to be Core Content? How much Core Content you need on your site will vary by blogger and niche. There is always the 80/20 rule, which works well with most businesses. I recommend having about thirty percent of your posts be your Core Content posts, with the remaining seventy percent having a majority of evergreen posts. Have your Core Content prominently displayed on your site, so anyone visiting will easily be able to locate it. Make sure to frequently update these posts, so they are able to be ranked well on the web and will continue to perform well. I know this sounds like a lot of work, but I hope you can see the beauty of having Core Content on your site! Do you think you already have Core Content on your site? What are you known for? Thank you for explaining in detail what core content is. I think I need more of this on my site! I agree many generic posts get lost on Pinterest! The 80/20 work is a good guide! This was so useful! I am a new blogger to wordpress and I always wondered what “cornerstone content” meant. This blog post totally cleared it up and now I want to try creating cornerstone content for my own blog. Glad you found it helpful, Juliet! I thought I had core content until I read your post. Now I need to rethink which of my posts are core content and which of them are just the theme of blog. Thanks for the suggestions. Thanks for sharing. I was just looking at core content and love the 80/20 rule. I do wonder, can you core content be something you already had on your website, or should it be new content, meaning should you be adding new core content regularly? Thanks for sharing. No, it can absolutely be something you have already written! If it is something that you are known for, that brings in a lot of your traffic- you may already have core content! I would go and update it though- make sure it is SEO optimized, has a few pinnable images, and opt-in, backlinks etc. Thanks so much for sharing! I was wondering if people would like more personal conen that they could connect to or more general information that is just simply educational info. I definitely understand what core content is a lot better now. And have some ideas on how to generate it! Thank you!